The next installment of the wiaiwya-7777777 singles club, and the fourth for 2014, is on the horizon. Well, the morning of August 7, to be precise. But because these little treasures have a way of selling out, I'm bringing it to your attention now as pre-orders are available. The single is "When I Fall In Love"/"Just Let Me Be Here" from Cardiff, Wales' The School. Astute fans of the indie pop world may remember this band's highly praised LPs Loveless Unbeliever from 2010 and Reading Too Much Into Things Like Everything from 2012. For those of you for whom The School is a new experience, know that this is the kind of achingly sweet indie pop championed in the past by Sarah Records, and more recently by Shelflife Records and Matinee Recordings. There are memorable melodies, jangling guitars, and winning vocals, and you can't help but feel good when you hear it. In a way, it is medicine but with no bad side effects. The A-side is presented below for your consideration. We're going back to 1971 and Sticky Fingers to pull up an underrated favorite of mine, "Sway". While the song is credited to Jagger-Richards like all Stones originals, Keith was MIA for this one and didn't play on it. 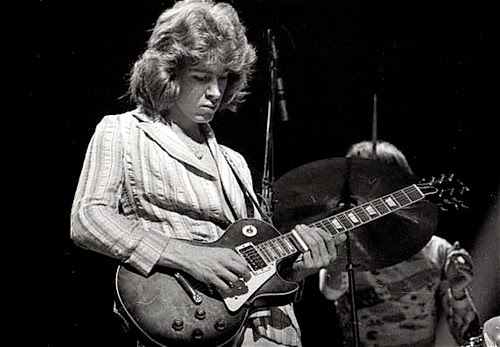 Mick Taylor has long contended he wrote the music and Jagger the lyrics. Taylor's slide guitar in the middle and then his solo at the finish define the song, just super tasty. Dahnu Graham, Daniel Kerr, Billy Robertson and Suren Unka are pigs! Specifically, they are the Beach Pigs, from Auckland, New Zealand. In early June they released Grom Warfare, which they say portrays two years in the life of the members of the band. I don't know that they've been up to anything all that different from any group of young men. But unlike most guys with whom I passed the time in my 20s, the Beach Pigs make really good guitar pop. The guitars shimmer and jangle with a hint of garage grit, and the vocals deliver power pop harmonies. The melodies are good, with a lot of variety, but equally impressive are the rich textures in some of the tracks, such as "Big Peach". 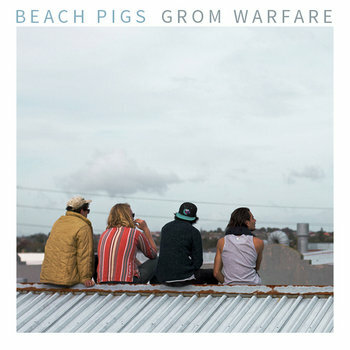 The Beach Pigs don't have a label, and have self-released Grom Warfare on Bandcamp. Sure, it will cost you some money, but it is just New Zealand dollars anyway. And think of the value of being the first guy in your group to have the original Beach Pigs album. Priceless, yes, priceless. I've included a few tracks and a video below, and you can stream the entire album at the Bandcamp link. It seems inevitable that I would fall in love with this album. It had a few obstacles to overcome, including the fact that I hadn't previously heard of this Toronto-based band, and I am not fond of misspelled names (weird, rude and nonsensical names are just fine, of course). But I was mollified on one of those points when I learned that a "w" was changed to two "v"s to avoid a conflict with another band named Always, and they wanted the visual similarity and insist on pronouncing Alvvays as always. Moreover, I'd read some very positive statements about the band from sources I trust, so I gave it a chance. And my firm conclusion is that all guitar pop fans should give this self-titled release a chance, because it is everything a good guitar pop album should be. The hooks are infectious and plentiful. Frontwoman Molly Rankin's vocals have the tone and emotional weight of Tracyanne Campbell (Camera Obscura), and the power of Wendy Morgan (The Popguns). And the arrangements are robust, fully realized, and determinedly sunny -- it is like Glasgow guitar pop on happy pills, or perhaps on a summer holiday to the coast. You know, the themes can be melancholy and a bit sad, but that doesn't mean the music has to bring you down. There is a hint of nostalgia in some of the '60s era melodies and surfy touches, but it all has a natural and cohesive feel. So, jangling guitars, sturdy basslines, well crafted songs with some wry humor, great melodies, and standout vocals. It sounds like summer to me, and it sounds like a highly recommended summer album for you. Alvvays consists of Molly Rankin, Kerri MacLellen, Alec O'Hanley, Brian Murphy and Philip MacIsaac. Alvvays is out now via Polyvinyl. Nineties-style noise pop (think Velocity Girl and Black Tambourine) has a permanent place in my heart, and my music collection. So I'm always on the lookout for bands that can satisfy my appetite. Happily, this week brings Working, a quartet from Rhode Island who has graced us with a three-track EP titled More Weight. The EP is released in digital-only format by Shelflife Record, an outfit that repeatedly impresses us with its ear for quality indie pop. On the More Weight EP Working demonstrates a great feel for the critical elements of the noise pop -- good melodies, sweet vocals and a wall of feedback. Couple that with some affecting songs and you have a band to treasure. We understand that an LP is planned for next year, but for the present this little nugget will do very nicely indeed. The members of the band are Catherine Kolodij (vocals/gutar), John Kolodiz (drums), Mary-Kim Arnold (bass), and Matthew Derby (guitar/vocals). As Astronauts, former Dark Captain Dan Carney takes you on an unlikely space journey. Rather than launch the listeners beyond the atmosphere, the new LP dares you to venture inward. To face the dark corners, the regrets, the insecurities, as well as the hopes, strengths and dreams. So for this one, turn down the lights, settle into a chair, put on your earphones and become immersed in the brooding, atmospheric electro-folk/pop of Hollow Ponds. Just in time, it is raining here. Perhaps perversely, given my introduction, the album commences with a soaring ray of light in the form of "Skydive". Already released as a single, I think it is one of the highlight songs of the year so far. Such moments of brightness aren't typical here, to be fair, but the emotional weight of the songs is adeptly balanced by the thoughtful acoustic instrumentation, hushed vocals, ambient electronics, intriguing rhythms and, quite notably, the judicious use of space. The brooding begins in earnest with the contemplative "Everything's A System, Everything's A Sign". The song is emerging as one of my favorites on the album for several reasons, but one is the delightful rhythm track. Driven by ominous instrumentation, electro-pop track "Vampires" is one of the more up-tempo songs on Hollow Ponds. Then the pace drops to dream state for the standout track "Flame Exchange". Hushed vocals float on gently picked acoustic guitar and a barely-there synths to create a sadly beautiful song. "Spanish Archer" gets the blood going again, bouncing along as perhaps the most mainstream pop song on the album. But Carney's more melancholy purposes pull us back on the following title track. In fact, the first third of "Hollow Ponds" is so sparsely adorned that the listener might be tempted to adjust the volume. Patience is rewarded, however, as the beat rises and vocals drop in, resulting in a very rewarding seven minute exploration of inner emotional landscapes. "In My Direction" continues the hushed vocals over yet another delightful rhythmic foundation. "Try To Put It Out Of Your Mind" is the electro-pop version of a relaxing babbling brook, while "Openside" crosses the line into indie rock territory, and is the most expansive track on the record after the opening "Skydive". The album closes with the acoustic plucking and nearly whispered musings of "Slow Days". Hollow Ponds is an interesting and rewarding journey. And at the end, we may all be able to call ourselves Astronauts. The album is out now via Lo Recordings. The Chills are among the stalwarts that made Dunedin, New Zealand a frequently name-checked source of great guitar pop in the '80s and '90s. Founder, frontman and sole constant member Martin Phillipps has assembled the latest edition of the band to tour and record. Last year they released new song "Molten Gold" only in digital format, as well as Somewhere Beautiful, an album of a live performance at a private party in 20ll (review here). Now the glittering guitar pop of "Molten Gold" is getting a well-deserved vinyl release. It will be paired with an re-working of the band's famed 1982 song "Pink Frost". You can stream both tracks below. "Molten Gold" will be released on July 29 via Fire Records on vinyl with an accompanying digital download. Pre-orders are available now. The Chills are Martin Phillipps (guitar/vocals), James Dickson (bass/backing vocals), Todd Knudson (drums/backing vocals), Erica Stichbury (violin/backing vocals), Oli Wilson (keys/backing vocals). Fire Records pre-order page for "Molten Gold"
The usual path of musical discovery to to become familiar with a band, and then experience the side projects of its various members. I've done things a bit backward here, as I first became aware of, and enamored with Brian Wakefield's recording project Emotional, which I covered several times in the recent past (here, here, and here). Through Brian's project I became familiar with Melted Toys, a west coast band consisting of founders Daniel Rosado and Steven Harkins, with Brian Wakefield and Ole Haarstad. Melted Toys' sweet spot is a hazy, lo-fi psychedelic pop that they first displayed on their 2009 Washed & Dried EP and have perfected for the new self-titled LP. Overall, the twelve tracks on the album reveal an impressive ability to create interesting dream pop songs infused with vitality and a welcome upbeat vibe. The sounds are a bit woozy and warped, with gentle but bright guitars and tastefully restrained synths. The vocals blend in with, rather than ride over the top of, the instruments, which enhances the relaxed atmosphere. If you are looking for an album to make you dance or pump your fist in the air, Melted Toys isn't the answer. But I've been hoping for a full length from these guys for some time, and I'm very pleased with what they have wrought. Every time I listen to it a feel peaceful and happy, and who couldn't use a big dose of that in their lives? And looking beyond that, songs this carefully constructed suggest that we can expect more good things in the future from Melted Toys. Melted Toys is out now via label Underwater Peoples.